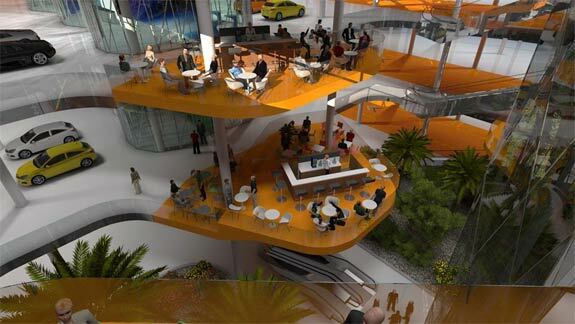 The Autopia Europia will feature over 100 shops, 40 insurance agencies and 20 banks. There will be more than 50 restaurants and pubs (alcohol and automobiles being such a good combo). To support the expected 6 million yearly visitors the complex will have parking for 900 cars and a dozen on-site petrol stations. Segway scooters will be available for rent to speed visitors around the whole thing. 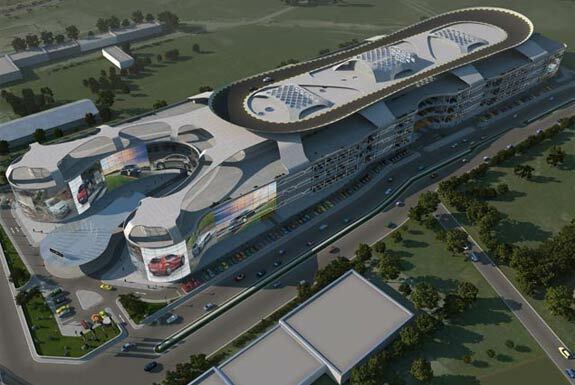 All told the Autopia Europia will have nearly 65,000 square meters of indoor space. How large is that? It’s over 700,000 square feet and more than 16 acres. It’s over 5 times the size of the car dealership that currently holds the record for the world’s largest (Longo Toyota in El Monte, California) and over 43 times the footprint of London’s Wembley Stadium. And those square-footage figures don’t even count the coolest par of the Autopia Europia: the rooftop racetrack. 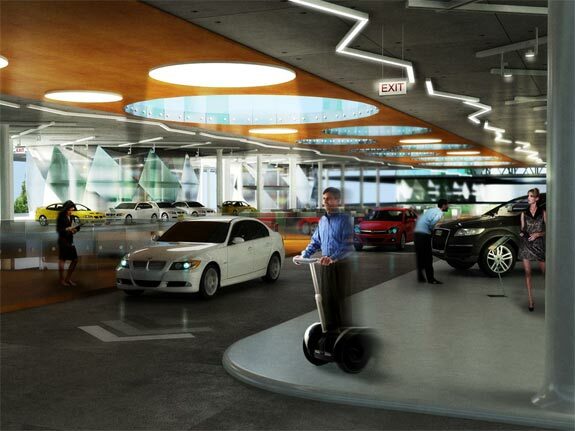 That’s where drivers can try out their potential wheels-to-be. Because what better place to test the speed of a new car than on an oval road 25 meters (80 feet) above the ground? So, come for the rooftop racetrack. Stay for the Disneyland-like spectacle. And—who knows?—you may even buy a car. NB. the Autopia Europia is actually larger than it appears in these photos. Each of the complex’s five stories are nearly three times the height of a typical building floor. And two of those stories are underground.